The Australian Mist stands out for its short, eye-catching coat characterized by agouti misting—hence the name—which gives the appearance that the spotted or marbled pattern is being seen through a veil. The spotted coat comes with symmetrical spots of any size or shape, including elongated spots or banding on the legs and an evenly ringed tail with a solid tip. The marbled coat has a pale background with symmetrically placed patches of a darker color broken with splotches of lighter colors. In both patterns, the coat comes in brown, blue, chocolate, lilac, caramel, gold or peach, and the face has delicate tabby markings. This is not a cat of extremes. It’s a moderate size and shape with a broad, gently rounded head, moderately large ears that are wide at the base with rounded tips, and large green eyes, giving the Australian Mist a generous, open expression. A long, thick, well-furred tail completes the picture. True to its open, friendly Aussie heritage, the people-oriented Australian Mist loves to sit in a lap. These cats enjoy being handled and even tolerate the attentions of young children, although of course the two should be supervised to ensure that the cat isn’t being treated roughly. Lively kittens grow up to become more serious adults, but they never lose their affinity for hanging out with their people and keeping them company. The Australian Mist is generally healthy and can live to be 15 years or more. Some Australian Mists are amenable to leash-training. This kitty from Down Under was developed in the 1980s with the idea of creating a pedigreed cat unique to Australia. This was achieved by crossing Burmese, Abyssinian and Australian domestic shorthair cats. The result was an attractive cat with an affectionate personality, lively nature and intelligent demeanor, all wrapped in a short spotted or marbled coat that comes in seven colors. First known as Spotted Mists, they were given the new name Australian Mist in 1998. Because it’s such a new breed, it has a detailed breeding history and records. 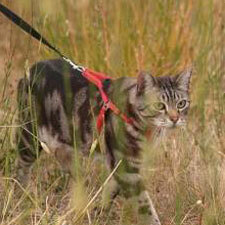 The Australian Mist is recognized by the World Cat Federation and the United Feline Organization.